What kind of suspension does my 1998-2000 Lincoln Town have? 1998-2000 Lincoln Town Air Springs (x2)- commonly referred to as air bags, a plastic and rubber bag that is fitted on top of the strut that uses pressurized air as a cushion instead of a metal coil spring to hold a vehicle off of the ground and off of its wheels. These are the number one cause of all air suspension leaks. All air springs all go bad at about the same rate. If one is leaking, the others will not be far behind. For a proper repair, all of them need to be replaced at the same time. 1998-2000 Lincoln Town Rear Gas Shocks (x2)- This vehicle is equipped with 2 rear gas shocks. These shocks are what absorb the impact of the rear tires hitting the road and make the vehicle ride smoothly. 1998-2000 Lincoln Town Solenoids (x4)- This vehicle is equipped with 4 solenoids. These plastic components connect the electrical connection and lines of suspension components to the suspension control module. The solenoids are responsible for regulating the air pressure in each air spring or air shock. Solenoids are a small piece of the suspension system but they play a big role in how well it functions. If a solenoid is not working properly, it will cause the vehicle to be unlevel and, in turn, cause the compressor to burn out. 1998-2000 Lincoln Town Compressor- This vehicle is equipped with one air suspension compressor. The compressor is responsible for pumping up the air springs and shocks. When the air suspension starts leaking, the compressor is forced to run continuously to try and keep the air springs inflated. After a couple of days of running non-stop, the compressor will burn itself out. Replacing the compressor is a timely and expensive project to undertake. 1998-2000 Lincoln Town Dryer Assembly- This vehicle is equipped with a dryer assembly. The dryer assembly is responsible for getting moisture out of the air lines. Once the air suspension parts start to leak, moisture will build up throughout the air system. Moisture damages the air suspension components from the inside out. The dryer must be replaced whenever the compressor is replaced to prevent further damage. 1998-2000 Lincoln Town Suspension Control Module- This vehicle is equipped with a suspension control module. This module is the brain of the suspension system and it reads all of the signals that are being sent by the height sensors and determines if the vehicle needs to be raised or lowered. 1998-2000 Lincoln Town O-rings- Although they are the least expensive parts of the air suspension, they are responsible for maintaining the seal where all of the air lines connect. Be sure to replace the O-rings when repairing any air suspension system. 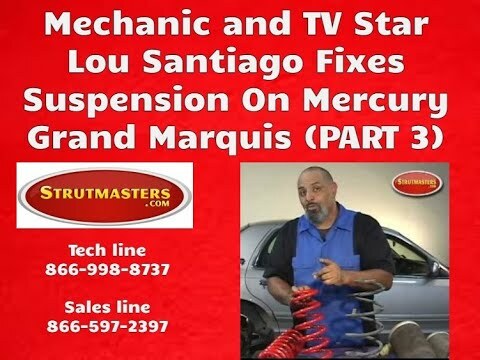 How Do I Know If My 1998-2000 Lincoln Town Air Suspension Is Failing? 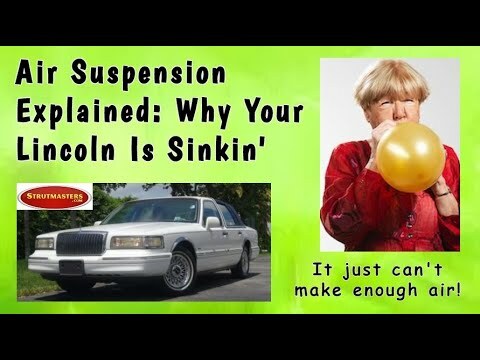 There are a couple of distinctive things to check for when trying to diagnose whether or not the air suspension on your 1998-2000 Lincoln Town is failing or has failed. A clear sign of suspension failure is a difference in the height of the front and rear of the vehicle. Ordinarily with this vehicle, the rear will fail first causing the vehicle to look like it is squatting down in the rear. Another sign of a failing suspension is the suspension warning light on the instrument cluster. Another sign would be the air suspension compressor running too long (The compressor should never run more than 15-20 seconds) or not at all and visible cracks in the rear air springs caused by dry rot. Why choose the Conversion Kit over replacing the air suspension system on your 1998-2000 Lincoln Town? The main reason the vast majority of our customers change from air suspension to one of our air to non air suspension conversion kits is the price. Our conversion kit does away with all of the complicated parts and electrical components and consists only of (2) premium Front Eibach springs. The suspension conversion is much more affordable and more reliable than the OEM equipment and it comes with Strutmasters “Limited Life-Time Warranty”. The installation is simple and requires no modifications to the vehicle. Installation typically takes about an hour per wheel and about 30 minutes to turn the suspension warning light on the instrument cluster. 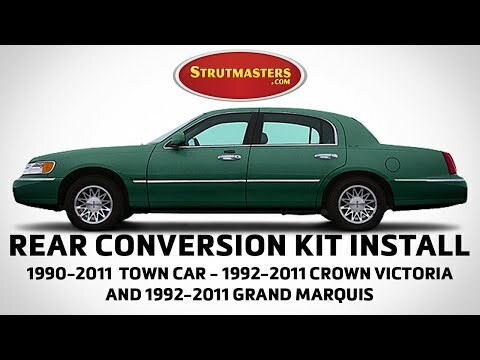 All of Strutmasters kits come with a complete set of easy to follow installation instructions with pictures and other helpful information. Also, you can find videos of us performing an actual suspension conversion on our YouTube channel. 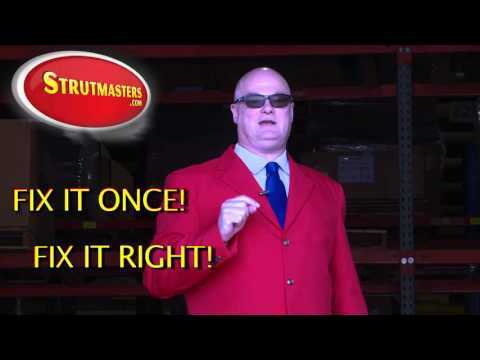 As if that isn’t enough, Strutmasters also has an in house technician available to answer your questions. = TOTAL: Over $2,500 (and that doesn’t even include replacing electronic components that are known to fail such as the height sensors). + over-the-phone technical support and a Limited Lifetime Warranty = Only $179.00 (plus s&h).